This photo is from a 4-page fold out brochure which contains maps and 2 other photos. The brochure measures 9' tall, 8' wide (folded), 9' tall, 16' wide unfolded. Printed in the mid 50s by the Greater New Orleans Expressway Commission. 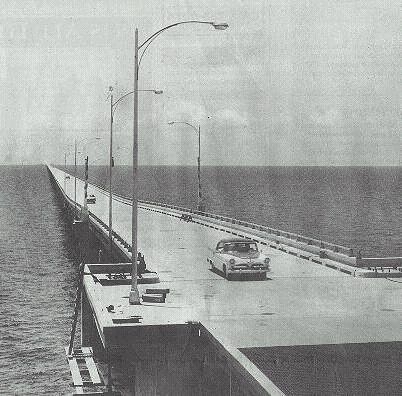 When it opened in 1956, the Causeway may have been the world?s longest bridge, but it was a bridge to nowhere. 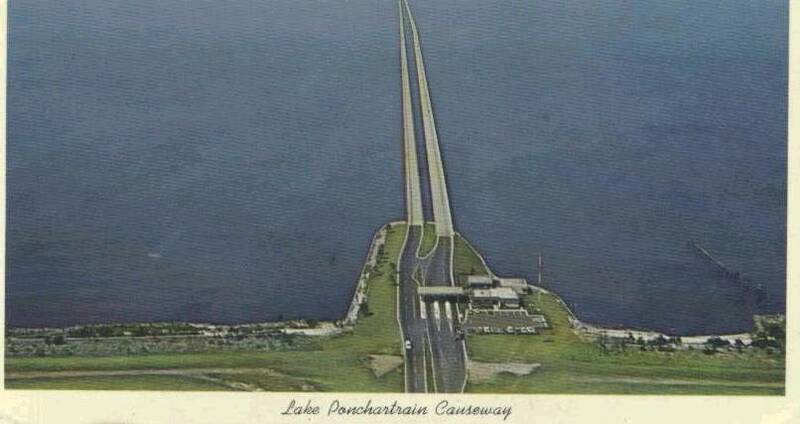 It spanned Lake Pontchartrain to connect New Orleans to the mostly rural, sparsely populated St. Tammany Parish. But by 1969, a second span was needed. With western St. Tammany booming at the end of the century, thanks in part to the Causeway, the bridge is groaning under the pressure of the added trafflc. For more info about the Causeway, including a web cam, click here.